Our under 16s were due to play against Burren, one of the top teams in Down, last Saturday. The game had been arranged weeks ago, as we are trying to ensure the boys play a game a week. If we do not arrange these matches ourselves, travelling to other counties week in and week out, the boys will end up with a paltry number of official fixtures. We are a city club, so if they can't get regular weekly games, they will simply turn to soccer, or PlayStation, or alcohol, or drugs. Three days before the match, the Antrim under 16 development squad announced that they were playing a blitz, which meant seven of our players were gone. That same day, the Burren coach rang us to say they could no longer field anyway, as the Down development squad was also meeting. This is a regular occurrence, which a few weeks ago almost caused one of our best coaches to walk away. It took several pints and group hugs to talk him back from the brink. A few days earlier, our minors had played against one of the west Belfast clubs in an official cup fixture. Their club is in a very underprivileged area of the city and they do tremendous work with their young people. But by the time they reach 16 the kids are abandoning the games. Belfast has a population of 700,000 (2011 census), compared to Dublin's 1.3 million. But like every other club in the city, there is no full-time coaching in the feeder schools, no strategy linking the schools and club, no regular matches, and no resources. The result is that a densely populated area that could be a powerhouse for Gaelic games with a strong sense of community is instead a wasteland. As the minor game unfolded, their subs ate pizza that had been delivered to the sideline, smoked cigarettes and poked fun at their team-mates. The referee abandoned the match with 10 minutes to go after a melee broke out. One of their club stalwarts texted me afterwards to say, "My heart is broken after watching that today, mo chara." This year, for the first time in living memory, the fabled Rossa club on the Shaws Road are unable to field a minor football team. In the second biggest city on the island, the real GAA is collapsing. Arriving in from our first minor league match on Tuesday night (which almost wasn't played because we couldn't get a pitch, until the St Paul's management managed to get the Christian Brothers' school pitch on the Glen Road) I watched the second half of Liverpool and Manchester City in the Champions League. It was a dazzling presentation. "Liverpool are back" said the commentator, "and they are absolutely vibrant." The language was pure hyperbole. City looked forlorn and hesitant. There was no hint that they could score four goals. In the end, they quit, and Liverpool posted a couple of nice finishes to kill it completely. But as these peripatetic, multi-national multi-millionaires strolled to victory, the commentary made it sound as though Liverpool city was again a thriving hub of soccer, when nothing could be further from the truth. As elitism and commerce has taken control of soccer, the grassroots game has collapsed. In a recent seven-part study in the UK, in The Independent, entitled 'The Nation's Game', that descent has been captured in all its horror. The once thriving amateur leagues have been disappearing at a rate of knots, participation has nosedived, and the game has increasingly become a spectator sport, with no real connection between the people and the clubs. The famed Crosby and District league which ran for 47 seasons until disappearing in 2014 is just one example among hundreds. Running costs were increasing, the number of referees reduced, the emphasis on elitism and development squads had a demoralising effect on participation, as the number of volunteers shrank, the costs of pitch maintenance could no longer be afforded and in the end, they had to close down. Just across the city, in Kirkby, an area with a population of 40,000, in 1990 they had two Sunday leagues and a Saturday league with four divisions. Today, those are all gone. In a striking symbol of how the few have been allowed to triumph over the many, the 40 acres of land that used to be their pitches are currently being sold to Liverpool FC for a new training facility costing £50m. Liverpool's billionaire US owner John W Henry won't mind that. He started out as a soya bean and corn trader before branching out into commodities in general, for example Liverpool Football Club. The Save Grassroots Football campaign, running since 2011, is gaining as much traction as the CPA. As their founder Kenny Saunders put it recently, "The Premier League is accelerating in one direction and the amateur game is accelerating in the opposite direction." He has an interesting view on development squads, one which chimes with John Horan's: " They take the kids away from their clubs, and make them fall out of love with the game before they can even appreciate it." Yesterday, Bective Rangers rugby club played their final game in the Ulster Bank League, Division 2C. Founded in 1881, they have had Lions and a host of Irish internationals coming from their ranks. But like other clubs, since professionalism, participation has collapsed. They have excellent numbers at mini-rugby level, which creates the illusion of a vibrant community sport (like the GAA up to Féile level, before elitism takes hold), then survive on a handful of teams. Fergal Campion, their 43-year-old senior coach, who has continued to play for the club up until now because of how short they are for numbers, said last week: "The commitment to the club isn't there any more . . . players would rather go and watch Leinster now than play a junior match." They have lost their sense of community. They forgot, as we in the GAA's leadership have forgotten, that the core of the game is its social benefits. That the crux is to support the games in the communities, resource the schools and clubs, encourage volunteerism, and as Campion put it, "create an environment where men and women, boys and girls can enjoy playing the games, irrespective of their level". The GAA's recently published report on the future for the association proposes that we move to a pro-sport governance model along the lines of the IRFU and that we pay county players. This payment is described as "an allowance" but as Professor Jack Anderson wrote last week, legally it is a payment which makes county players professional and will therefore allow free movement between counties in accordance with the law. The philosophy behind the payments is that they reflect the huge commitment required by county teams. The principled solution would be to shorten the county season dramatically (five months is more than enough), creating a proper club season and making sure our young men had the best possible opportunity to create a good work/life balance. But this is the opposite of the elitist philosophy that now grips Croke Park. 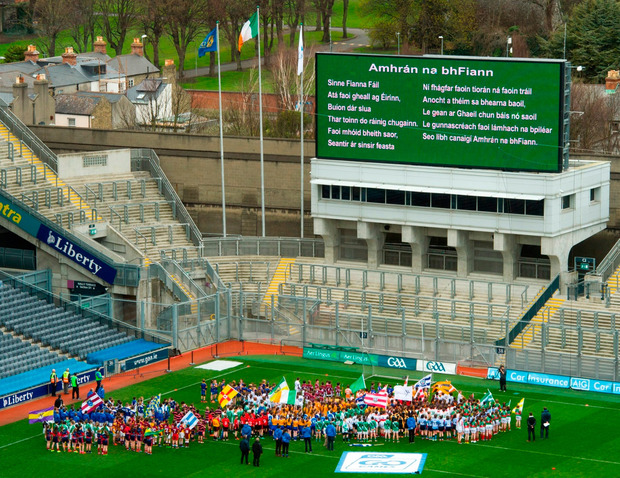 Notwithstanding the fact that everyone accepts that the GAA cannot support a proper professional game, in every meaningful respect we are following the paths of sports that can. It makes no sense. The crux is that if we continue as we are doing, like rugby and soccer we will become a spectator sport, where the audience are mere consumers. Participation which is already more or less irrelevant after 15 or 16, will continue to deteriorate, the volunteer ethos will continue to dissipate (since that depends on faith and a sense that we are all in it together) and on All-Ireland final day, we will be half watching from the sofa as the Dubs wallop whoever, like the audience watching John W Henry or Sheikh Mansour's current playthings diving about the place. And when we gather up to play the odd match ourselves (if we can find 15 players), we can eat pizzas on the sideline, smoke fags and fist-fight. Independent.ie Sportsdesk All-Star goalkeeper Eoin Murphy is the latest Kilkenny player to join the injury list after he was forced off while in action in a club match with Glenmore last weekend.